Working draft: Like Abe Simpson’s angry gesture to a cloud, Poseidon shakes a trident at the Franklin Institute as if to shout, “LEGOS!” Working draft: Like John Bender before him, Poseidon defiantly lifts his trident in front of an institution of learning. 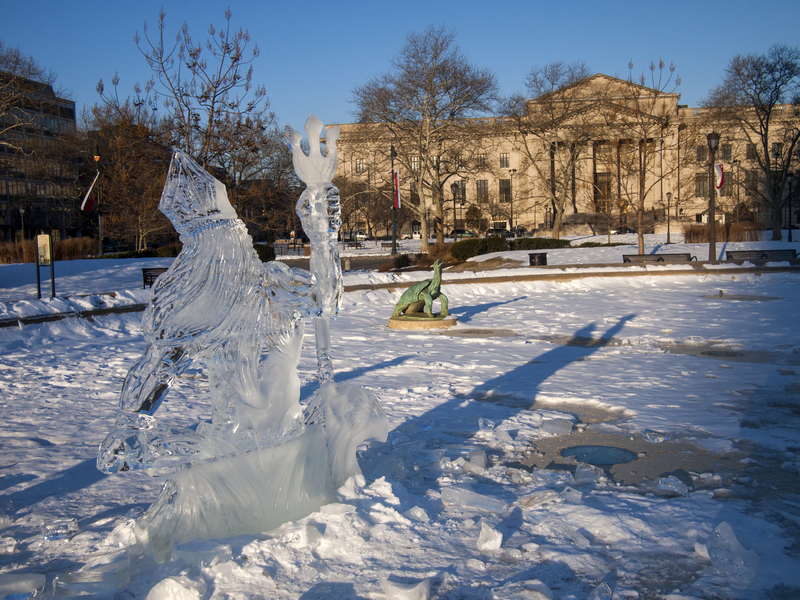 Harrison’s second surprise ice sculpture this winter, Poseidon riding a wave in Logan Fountain, 25 February 2015. 04 Mar	This entry was published on March 4, 2015 at 7:25 am. It’s filed under Fairmount/Art Museum and tagged #whyilovephilly, Benjamin Franklin Parkway. Bookmark the permalink. Follow any comments here with the RSS feed for this post.